If you've always wanted to fly over the city in a balloon your dream trip is now available! Why not try it on your next visit to Paris? 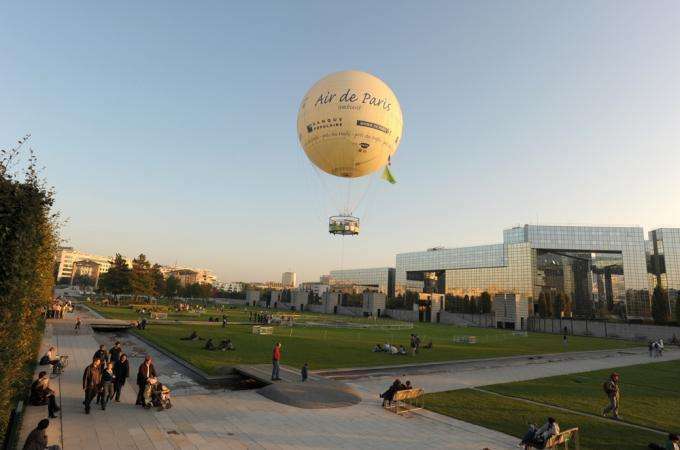 Generali offers instructive and dazzling flights 150 metres above the capital from the green spaces of Parc Andre-Citroën, just minutes from our hotel. Admire Paris from the sky by measuring the air quality! For 17 years, the André Citroën park has hosted an exceptional attraction that has already enchanted almost 500,000 people. Originally, these unique balloon flights were simply intended as a new and unusual way to discover the capital when they began in 2008. Now, the balloons are on an ecological mission in partnership with AIRPARIF, the French organization dedicated to monitoring air quality. It’s an experience that is beyond fantastic and when you climb aboard to embark on your journey you become part of an exciting trip to the heart of today’s environmental concerns. Your flight is educational and fun and each climb plays an important role in raising our awareness of pollution. You’ll discover the famous LOAC real-time particle identification and measurement instrument that was developed by CNRS. Over the course of this fabulous journey, you will become an expert on air pollution; nitrogen dioxide and fine dust, and its impact on the planet and its people. You will also take an actual measurement. Feel free to try the family excursion where everything has been designed to facilitate understanding, particularly for younger fliers. You can get there easily from the hotel by walking down rue de la Convention or by taking the metro for two stops.